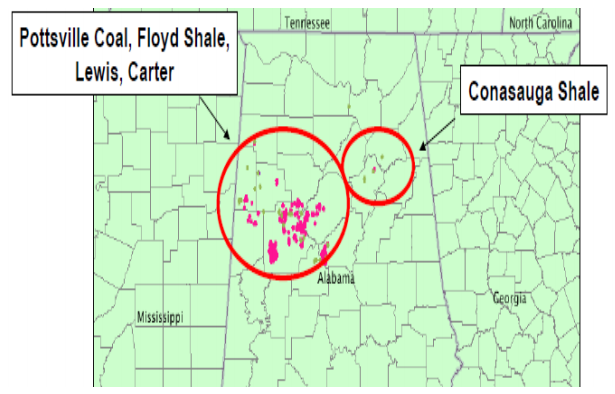 The Floyd-Neal/Conasauga shale gas play is located within Alabama and Mississippi in the Black Warrior Basin. Due to the lack of data published on the individual shales, the FloydNeal and Conasauga were combined into a single play for evaluation purposes. 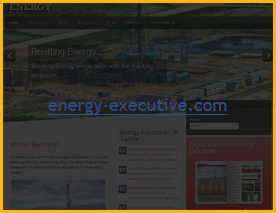 According to Deutsche Bank, the Floyd-Neal/Conasauga shale contains approximately 2,429 square miles of combined active net acres with an average EUR of about 0.9 BCF per well and 4.37 TCF of technically recoverable gas. The shale ranges from 6,000 to 10,000 feet deep and 80 to 180 feet thick with a well spacing of 2 well per square mile (320 acres per well). Average properties of the Floyd-Neal/Conasauga shale are: depth (8,000 ft.), thickness (130 ft.), porosity (1.6%), and total organic content (1.8%). There are 8 companies active on the shale, and these companies have leased a total of 1,554,601 net acres (2,429 square miles). 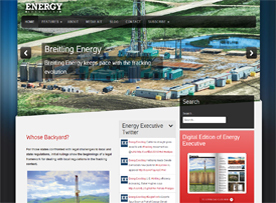 Since the Floyd-Neal/Conasauga shale play is a new developing play, there is minimal information published for the future drilling activity for the companies who are currently holding leases within the shale. The average well cost for the Floyd-Neal/Conasauga shale is $3.0 million dollars as reported by Deutsche Bank.